While China Outbound tourism market is constantly growing we can observe a shift in the travel habits. Travelers are looking at new destinations and new activities and Greece is one of the newest trendy destination for wealthy travelers. Looking int the details, specialists have observed a growth in the number of Chinese tourists in Greece for the last few year. Greece have seen a gain of popularity in the last few years. In 2018 32 millions foreigner have visited Greece. 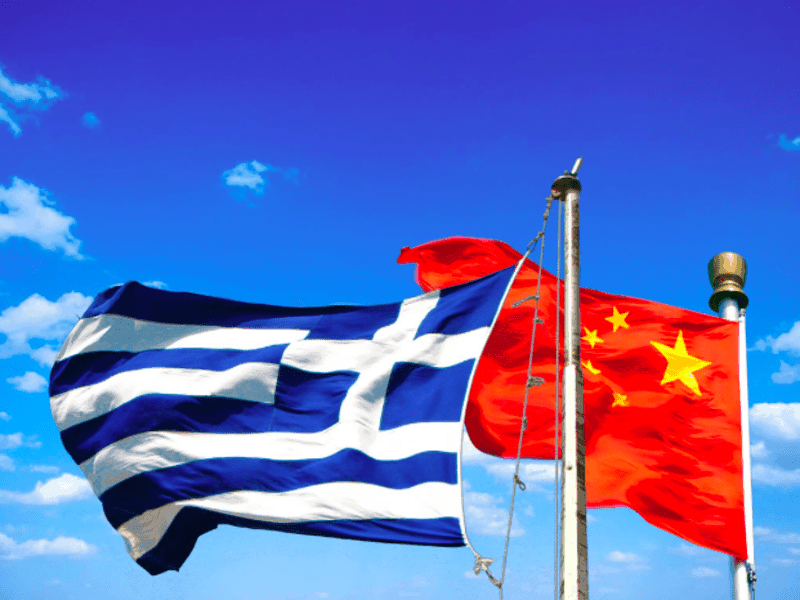 Greece and China tourism organization are working hand in hand in making Greece a new destination of Chinese outbound tourism. looking at 2018 figures, it seems to be working. 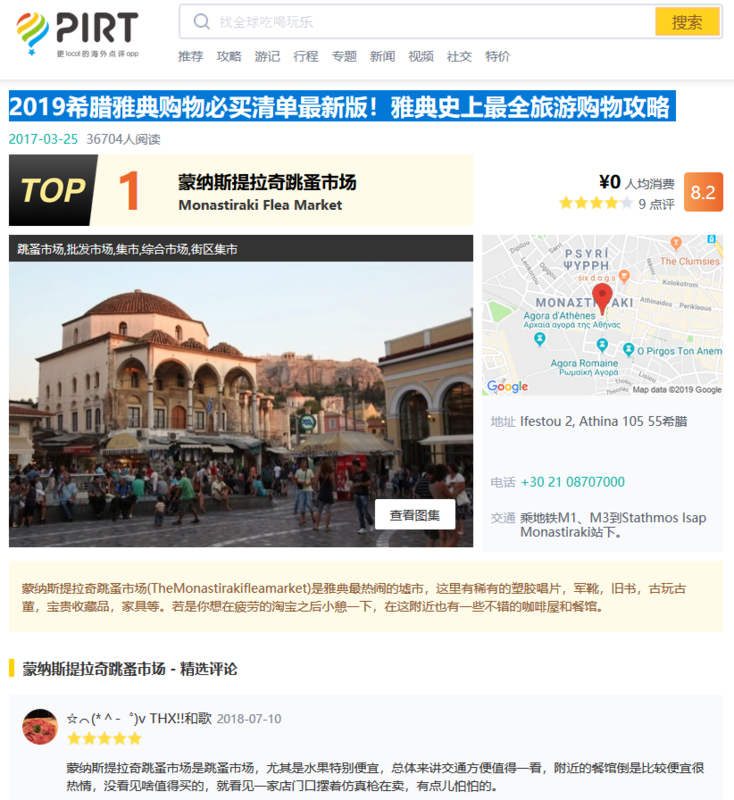 The efforts are paying off with 200 000 Chinese visitor in 2018 and a 22% growth in the 9 first month of the year. In this optic he is hopping the see the development of cruises, exhibition, sports etc. Activities that will be designed especially for Chinese travelers. For instance, for 2019 the ministry is planning to promote travel to Greece with campaign in partnership with the biggest tour operator in China which will be advertised on popular Chinese platforms and also use KOLs. The campaign will have the purpose to introduce the beauty and cultural richness of Greece to a wider audience. The work that is being done by the Greek government to promote Greece as a cultural and luxury destination is a great opportunities for you. 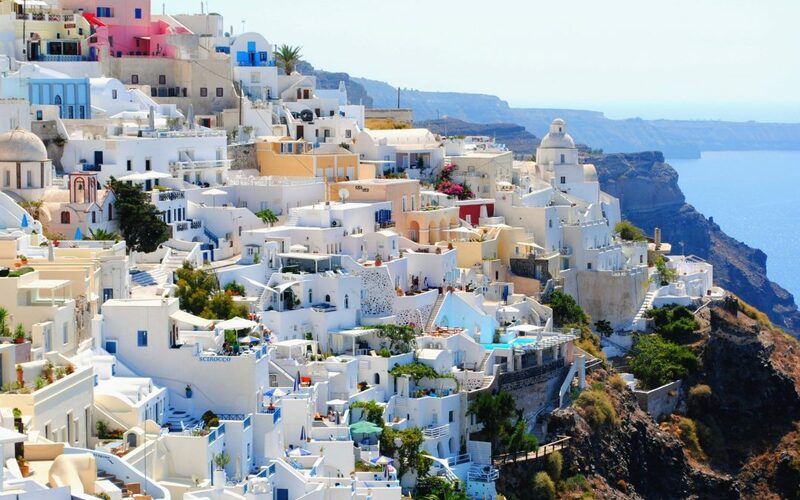 It will get wealthy travelers into looking for information about Greece and why they should travel there. Your main job will be to make sure you appears in the searches results. To start with, make sure it is easy for internet users to find you online. Keep in mind that Google is blocked in China and the most popular search engine is Baidu with almost 70% of the share. If google can be set in as many language as possible it is not the case for Baidu. 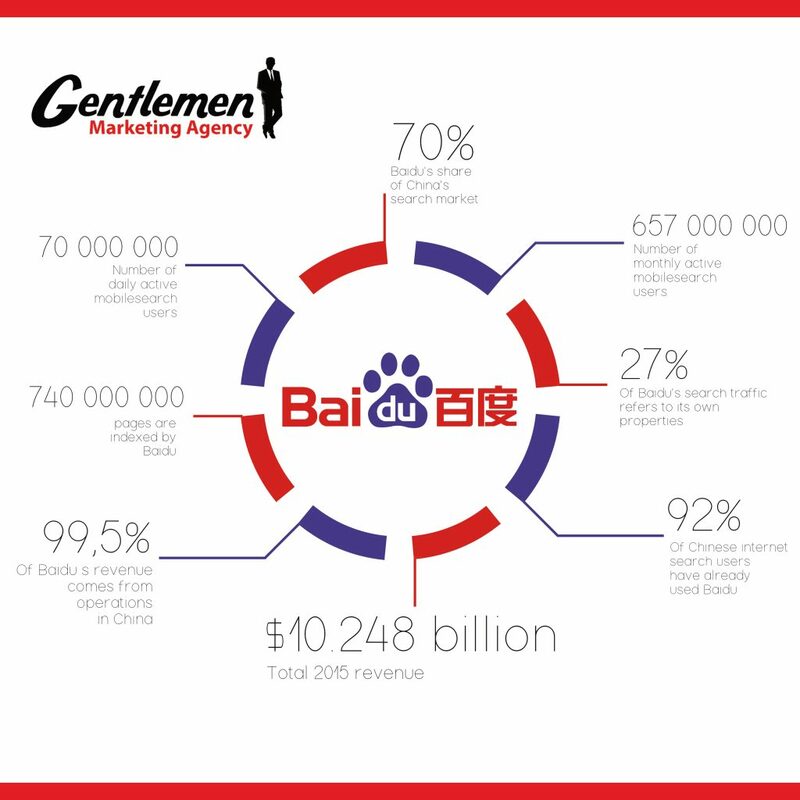 Baidu is set up for Simplified mandarin. Foreign language page barely rank on Baidu and do not get clicks. The vast majority of the population does not speak English. Because Baidu is only in Chinese mandarin, the searches system is sophisticated and will show the users only the most relevant results to the keyword they enters. You can’t afford to use google translation to create your content as it will not be precise enough and will not make any sense. In order for your website to rank you need to post original content on a regular basis. Your pictures needs to be well optimized with alt text and description. The last suggestion we will give you is to host your website in china or a neighbor country to increase the loading speed and your ranking. Having a website in Chinese is a good start but it won’t make you successful by itself. In china, reputation is crucial. In order to build yourself a good e-reputation you will have to make sure you are present online. Not only on your own website but on blog and forum (weibo, baidu tieba, douban etc…). 68% of Chinese consumers admit looking for reviews and shopping experience before making a purchase. What is more convenient than internet for that matter? You will have not only to feed conversation about your brand but also manage bad reviews and answers to the good one. A good content management and PR is the best way to show your potential customers that you care about them and their experience with you. One of the most efficient method to get the public trust is by using Kols. They are very influential and their reviews seen as authentic by internet users . They are present on all Chinese platforms (weibo, wechat, t-mall, JD, little red book etc) giving you the choice to operate your campaign on the most adequate of them for your business. It is not easy to find the good fit for your business but it is possible. Once you find the good fit, create campaigns. They can be very basic one such as banner campaigns or review or more complicated one like contests, which if well done is great to go viral. In the travel industry however having good reviews for your services is going to be vital. Consequently we would suggest you to get an influencer writing about your services illustrated with eyes catching pictures of your hotel, shop, restaurant… and possibly give-away. You should be familiar with Weibo and Wechat by now. They are huge, for instance Wechat has over 1 billions account. Both the platform are focused on community and content sharing but in a different way. Weibo often call the Chinese twitter is perfect for content sharing and viral campaign. You can post as much content as you want and it can be shared to anyone. 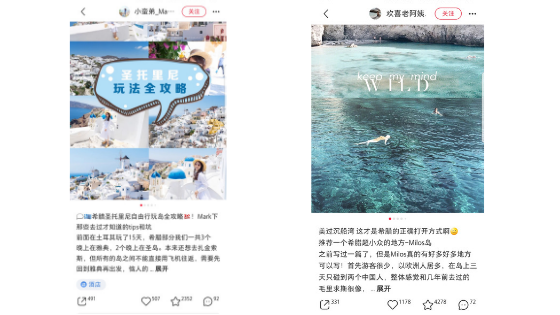 Wechat also offers you the possibility to share content but differs in weibo in the amount of post you are allowed to share and how it will be shared. Wechat is a closed social app meaning that as a user you can only share content to your friend and family. In both case, the content needs to be original and useful to be worth sharing and get visibility. Just to give you two example when it comes to Greece: patrimony and food. You are lucky enough to have a business in a country which history shaped the modern world with a patrimony still standing to illustrate its greatness. Chinese are proud of their long history and patrimony and they can easily create a link between the two. Chinese also love to food and are curious about it. They are not afraid of tasting new gastronomy and particularly enjoy trying local food when traveling around. Show-off locally grow fresh product, specialties and their particularities. We said it earlier, china traveling habits are changing, it illustrate in an increase of independent travelers planning their trip by themselves. 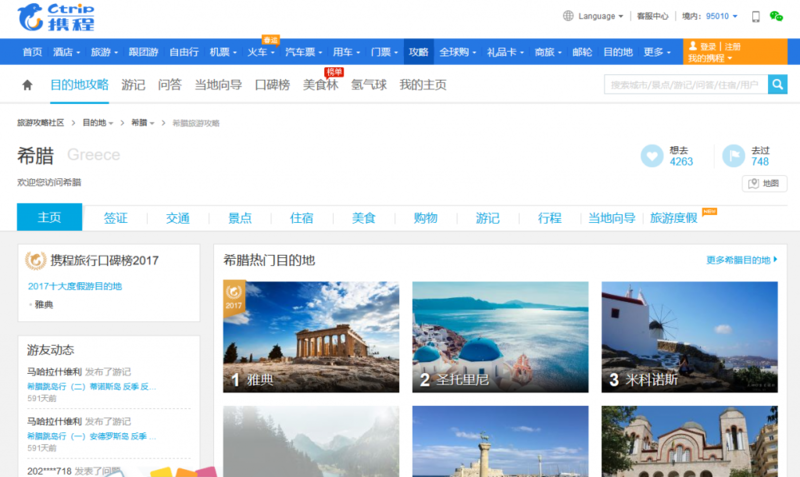 As in the west, Chinese travelers use booking platform to plan their trip. The most popular one are C-trip, E-long and Qunar. Users love the convenience of it. Everything is in one place allowing the to plan their trip without having to switch from one website to another. We highly suggest you to be there. It offers: visibility, credibility via rating as well as an easy way to display good deal and it make it easy for consumers to convert. It is also worth noting that the platform are the perfect medium to display discount and consumers are expecting discount. Chinese traveling habits are switching toward a more adventure oriented tourism but shopping and luxury tourism still have great days ahead of them. Greece is now the perfect combination of this two types of activities. Greece cultural patrimony is seen as sophisticated while its landscape and position in the Mediterranean make it the perfect place for a city-break, discovery as well as leisure while eating some very local fresh food. You are n hotel, a luxury store, a restaurant or a travel agency and looking forward to pleasing Chinese consumers? Contact us to talk about your project wit the GMA specialists.